Mi Fan Festival 2018 is starting in India from 3rd April 2018. Mi Fan Festival 2018 Live 10 Am 2nd April – 4th April. Exciting discounts on product, New Device launches & Much more fun. Tips for MFF2018 Sale. More Likes, More Discounts 10 AM 2nd April – 11 PM 4th April 2018.Today Mi is introducing some special gifts and surprises in your city for Mi fans so don’t miss the chance to go out there with filling the simple form you can be invited there. How to Get Mi Fan Festival 2018? Visit – http://event.mi.com/in/sales2018/mff to know more! Video must be with your original sound. Shoot the video in full screen – vertical format. Your video(s) should be funny, creative and unique. Every year, Xiaomi celebrates Mi Fan Festival (MFF) globally to commemorate its foundation day – April 6, 2010, by thanking and rewarding Mi fans. This celebration includes amazing deals and discounts on various Xiaomi products and online games which feature huge prizes. Mi fans eagerly await this festival as they can buy their favorite Xiaomi products and take part in fun activities. 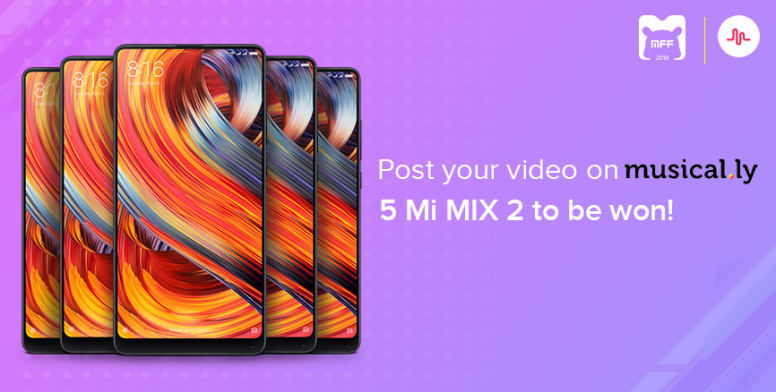 Starting from 31st March to April 6th, you can participate in musical.ly contest to win Mi MIX 2.